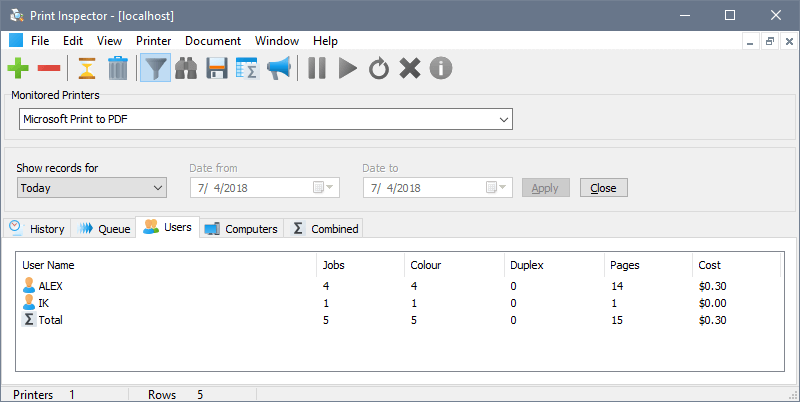 Print Inspector records every job printed on a monitored printer. Firstly, detailed job information is shown on the History tab. The details include the user name and computer name that the job was submitted from, document title, number of pages and number of copies printed, printing cost, job type, date and paper size used. C (Colour). Displayed if the job is printed in colour. Otherwise it is presumed to be black & white. Some printers incorrectly report all jobs as colour or black & white regardless of the actual job type. This is a known issue, however no solution is currently available. D (Duplex). Displayed if the job is double-sided for printers capable of duplex printing. The Queue tab is described the queue management chapter. To see the Total item, choose View – Display Totals from the main menu.